A common name for the Muntjac is “Barking Deer “. This comes from the repeated loud bark given when alarmed or as communication between adults. Adult body weight ranges from 10 kg to 18 kg. Bucks (adult male) being slightly larger than Does (adult female), but larger weights have been recorded. 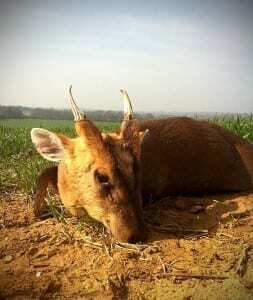 Figure 2 “Photo” Adrian Banks with his Muntjac taken with a rifle. Colouring being a russet like brown in their summer coat turning to a darker brown in their winter coat. Bucks have long pedicles with short antlers, casting May to July and growing new ones over the summer. They have large visable canine tusks. Although they do not grow to the size of Chinese water deer canines. Both bucks and does have very large facial (sub orbital) glands below the eyes. They have a short, fairly wide tail which is held erect when disturbed. Muntjac have proved very succesful in establishing themselves in British countryside. Muntjac populations can reach very high densities and can cause a lot of damage and impact on ground flora. They were originally residents of decidous and coniferous woodland; spreading across farmland, but are now also found in urban areas and gardens. Diets varies depending on where they live. They will feed on coppice shoots, flowers, seeds, nut, fruit, ivy and even garden produce and ornamental plants. Figure 3 “Photo” Several trophy Muntjac are displayed for all to enjoy and remember the hunt. Nature Status: Muntjac are classified as invasive non-native species in Britain and their release into the wild is prohibited under section 9 of the Wildlife and Countryside Act 1981. Life Span: Life span can be up to 16 years, but this is exceptional. Hunting: Early evening/morning hours tend to be the most productive either as a walk and stalk or from high seats/hunting towers. Muntjac are the smallest of the six wild species of wild deer in Britain. Introduced to Woburn Abbey in the 19th century, which then lead to escapees building up a population across the country. Preferred Caliber: Minimum caliber of .220 with a minimum bullet weight of 50 grains and a minimum muzzle energy of 1000 ft lbs. Archery: Bow hunting is illegal in the UK. Optics: A good quality scope with a large objective lens such as an 8×56 or a good variable. And good binoculars as muntjac can be hard to see in thick cover. capable of breeding from 8 months old. Gestation period is 7 months, normally giving birth to 1 kid. They are able to conceive just days after giving birth. When culling doe’s, heavily pregnant doe’s should be selected, this ensures there is no dependent kid will be orphaned. Method: Walk and stalk methods or from a high seat/tower in early morning/evening tend to be most productive.